Value stream mapping is a method to analyze all processes, taks, and value stream in the company and its supply chain, from the time customers place an order up to receiving the products. This method will help to identify both value adding and non-value adding processes. 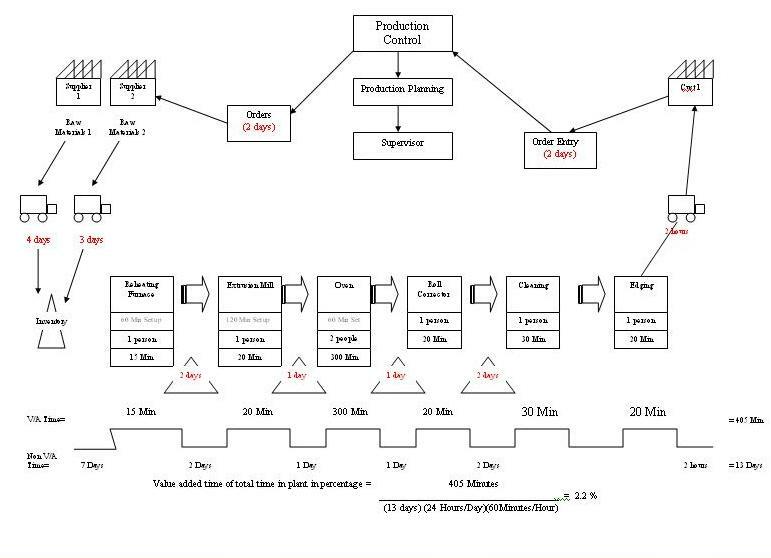 Once they are drawn up in a one page picture, the non-value adding processes such as long lead times, bottlenecks or idle time can be removed, or the process required to make some parts can be arranged in a specialized work cell to reduce inventory and that waiting time between operations. In this way, the overall process can be improved, lead times reduced, throughput increased and thus an increase in customers' satisfaction through a more efficient and flexible supply chain. Value stream mapping is a popular framework tool of lean manufacturing consultants in identifying wasteful process tasks and steps.